The history of the Palmerston Railway Station is directly linked to the development of the Town of Palmerston and the railroad. 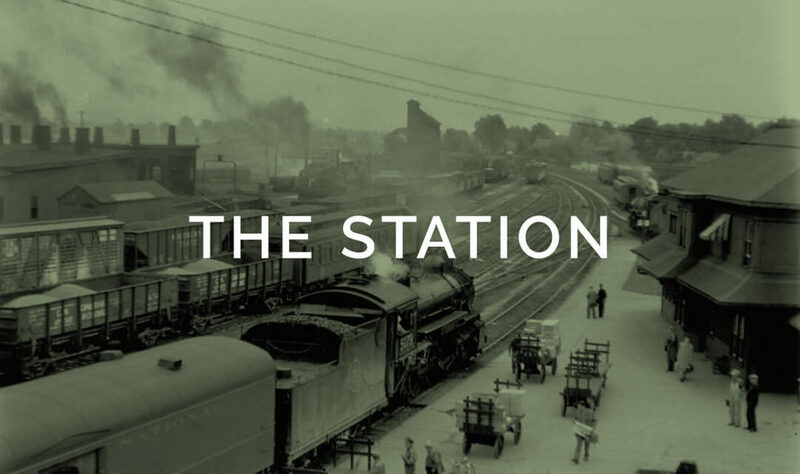 The first station was built on Lot 19, Concession 11 of Wallace Township, Perth County. It had been built in 1871, by the Wellington, Grey and Bruce Railway, at the point where the southern extension branched off from the main Guelph-Harriston line. This first station was a single storey building, around which the town eventually developed. In 1876, due to the increasing amount of traffic through the station, the railway officials had an additional storey put on the station. This second storey was used to house the offices, which left the lower floor to be used exclusively for waiting and baggage rooms. This was a major improvement at the time which was needed to accommodate the travelling public. While there has been some debate surrounding the addition of the second storey on the original station, we have uncovered some proof of its existence from a copy of the Mount Forest Confederate, which published a story from the Palmerston Telegraph on October 21, 1876. Once the Grand Trunk Railway had taken over, the station went under another great transformation in 1900. To help compete with the exotic routes and travels enabled by the Canadian Pacific Railroad, the Grand Trunk Railway upgraded their stations. Palmerston appears to have benefited the most from this decision. They completed a West Elevation in the front of the station, allowed for a walk-in storage attic, and above the ladies washroom added a tower, and does not appear to have had an entrance. The tower lasted less than ten years, as it was destroyed by fire in 1912. After the Canadian National Railroad had taken over the Grand Trunk Railway, the station underwent another dramatic transformation. During the beginning of the Depression, the CNR installed a false ceiling in the Main Waiting Room, with the intent to save heating costs. In 1936 it had also been painted in CNR colours. By the early 1950s, the traditional board and batten had been covered up by insulbrick which was then painted red. By 1959 the steam locomotives had been replaced by diesel locomotives, which led to the removal of the roundhouse, roundtable and coal sheds. In 1970, Palmerston saw its last passenger train leave the station. However, unlike other stations which were being abandoned or torn down, the Palmerston station remained as a freight centre with men working out of it. By the mid 1980s, however, the CNR requested the right to abandon the rail line through Palmerston, which saw the official closing of the station in 1982, where it remained abandoned until 1996 after the track was torn up from Harriston to Stratford. On June 3, 1996, the Town of Palmerston presented an offer to the CNR to purchase the railway property. It was also in 1996 when resident volunteers began to organize a group and the money to replace the leaking roof. By 1998, the Town of Palmerston was able to fully purchase the 26-acre yard from the CNR, and initiated the CN Property Task Force which was responsible for overseeing the development of the property and renovation of the Station. With the help of volunteers and the Palmerston Lions Club, the major renovations began which have led to the station’s present appearance. It has been returned to its 1900 Grand Trunk look, by having the insulbrick removed, board and batten replaced, and the dropped ceiling removed. The original wood of the ceiling was professionally grained to simulate its original appearance. The Agent’s Office was stripped down to its original tin ceiling and the Conductor’s Room was converted into a kitchen by the Palmerston Lions Club. The Palmerston Station remains the only original station left in Wellington County and one of the few designated as a railway museum in this part of the province.